Do you have a favorite Christmas drink? Is it hot chocolate? Cider? Eggnog? 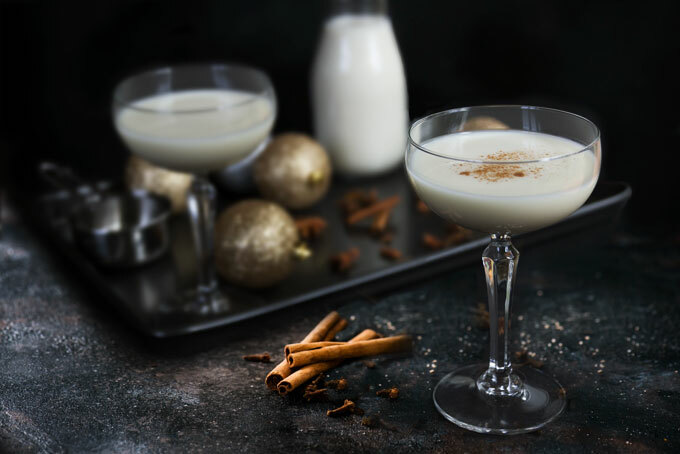 How about vegan eggnog (if we can call it so)? The only person I distinctly remember liking eggnog in my family is my uncle. One of my earliest memories is of standing on a wooden stool in the kitchen and watching my uncle adding bourbon to a bowl in a slow stream. I must have been 9 or 10 at that time because I had to stand on the stool to have a good view. As my uncle set to work, he would tell me about the do’s and don’t of every good eggnog. Make sure no speck of yellow gets into the bowl of egg whites … Don’t pour the bourbon in so quickly that it scrambles the yolks … Gently fold – don’t chop – the fluffy whites into the mix… Do NOT shake the nog or you run the risk of incurring froth damage before the tasty toddy has reached its peak. For anyone who enjoys cooking (or mixing cocktails), a process requiring such precision can’t help but be rewarding. For me, making eggnog is just the first step in enjoying it. Subsequent waves of pleasure come in sharing it with friends and family every year. I’ve been on a cashew nut milk kick lately, partly because I like the rich but neutral flavor of cashews, partly because I don’t have to strain it like almond milk. However, if I’m out of cashews, I do find that almond milk is the next best option. So that’s what I used as a base for this vegan eggnog together with a frozen banana to tip it more towards a thick smoothie consistency. If the nog isn’t thick enough, I also add hemp seeds, but you could substitute them for a few soaked cashews. The level of spiciness in this drink, is up to you. I like mine super cinnamon-y, but go light on the clove and nutmeg. 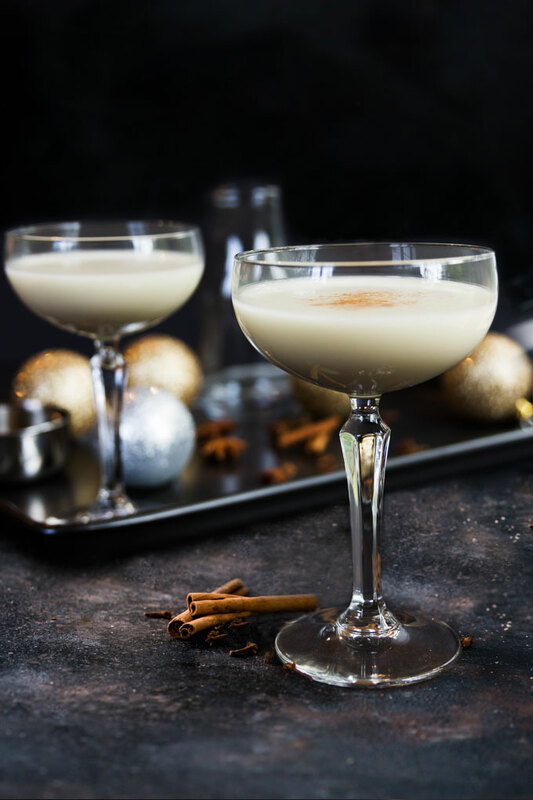 Some people like their eggnog super nutmeg-y and less cinnamon-y. So start with with just a little bit spice, blend, and add more if you’d like. The same goes for the Medjool dates. I usually make my eggnog with just one date, but others might enjoy it a little sweeter and more caramel-y. If you’re wondering about the lemon juice, many traditional eggnog recipes call for it. It adds a nice tanginess and brightens up the otherwise purely sweet flavor. In this recipe, the lemon juice also prevents the banana from turning brown and helps the eggnog maintain a nice bright color. If you have a choice, use bananas that are just ripe and have a nice yellow color. The older the bananas get, the browner they become. The goal is to make this eggnog as light (and yellow in color) as possible because that’s what traditional eggnog looks like. 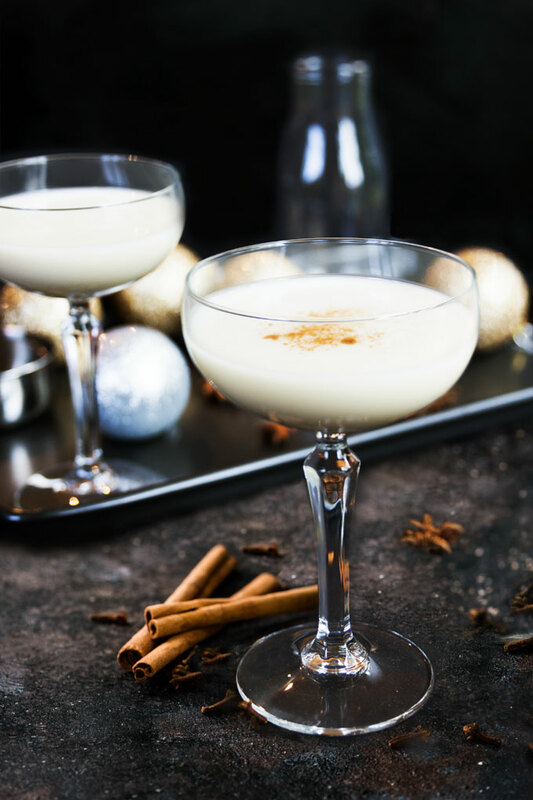 As far as the preparation method goes, it’s much simpler than traditional eggnog. 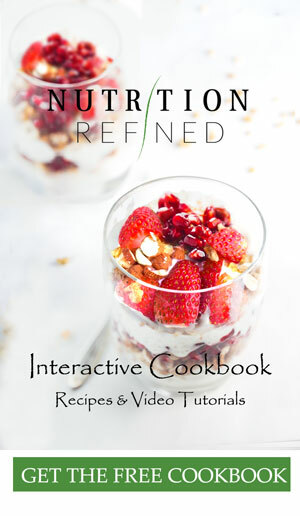 All you need is a blender and 5 minutes of your time. If the final drink is too thick, add more plant-based milk; if it’s too thin, add more cashews. 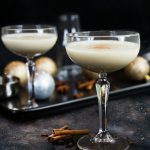 While traditionally made with raw eggs and alcohol, this vegan and non-alcoholic eggnog is equally delicious. It's rich, creamy, sweet, and nutmeg-y. Place all ingredients in a blender and blend on high until the eggnog is completely smooth, Add spices according to taste.